If you’re visiting Sedona, Arizona, you might consider taking a side-trip over to nearby Tuzigoot National Monument. 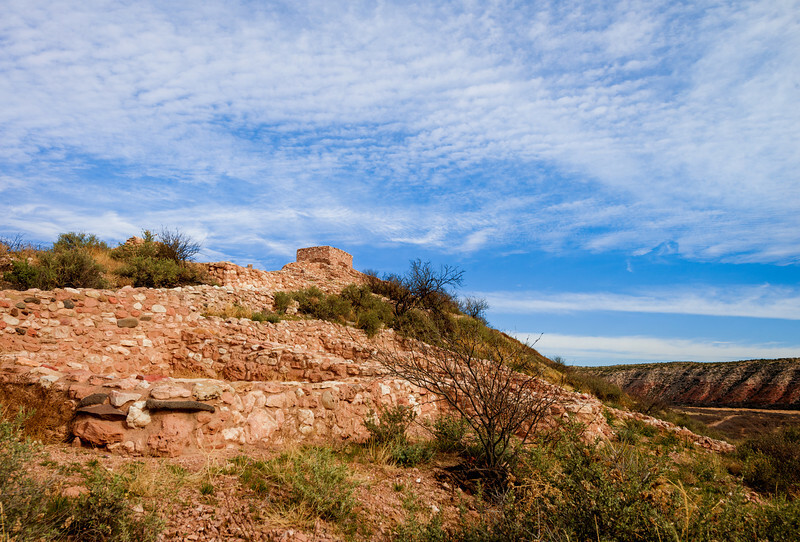 This post covers whether Tuzigoot National Monument is worth the time, along with what to expect there to help you decide if you should visit the Tuzigoot ruins. First, let’s cover getting there. From Sedona, Arizona, it’s about a 30 minute drive to Tuzigoot, which is located on the outskirts of the small town of Clarkdale, Arizona. Unsurprisingly, it’s sort of out in the middle of nowhere. I won’t even begin to try to give you directions there–only those who really want to get lost ever follow my directions. Not only is Tuzigoot close to Sedona, but it’s also close to a couple of other National Monuments: Montezuma Castle and Montezuma Well. I’ll cover those in-depth in a subsequent post, but the short version is that Montezuma Castle is very worthwhile to visit, and Montezuma Well is interesting, but not much to see. Tuzigoot National Monument is open daily from 8 am to 5 pm, and unlike other National Park Service locations, those hours are strictly enforced–the area is gated off when the park closes and gated until about 10 minutes before opening (not that I made that mistake myself or anything…). We recommend allotting about an hour to experiencing the Tuzigoot ruins and its (short) trails, and the Visitor Center, which houses a museum. There are restrooms and a gift shop in the Visitor Center, but no restaurant is available on-site. Above is the view of the Visitor Center from the top of the ruins. It’s a really short walk. As for Tuzigoot National Monument itself, it’s pretty cool. 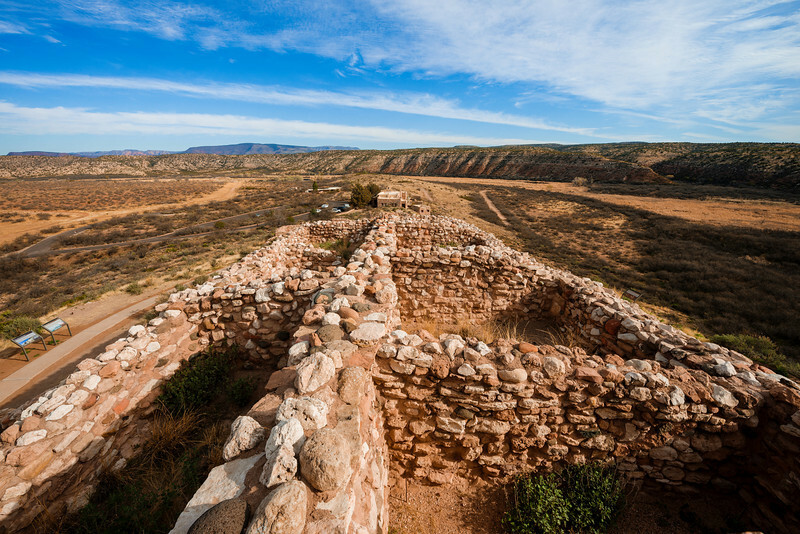 Basically, Tuzigoot is the ruins of a 3-story pueblo complex, consisting of restored stone masonry rooms that were built along the spine of a natural outcrop in the Verde Valley. The central rooms in Tuzigoot are taller than the outside rooms. It’s believed that the center rooms served as common or ceremonial areas, while the outside rooms were, essentially, bedrooms. In total, the pueblo has 110 rooms. Historically, the Tuzigoot pueblo was built by the Sinagua between 1125 and 1400 CE. Tuzigoot is the largest and best-preserved of the Sinagua pueblo ruins in Arizona. Interestingly, there are few doors in these ruins because most rooms were entered through the roofs. So, as with Montezuma Castle, there were a series of ladders and rooftop holes for access. Contrary to popular belief, these ruins are not entirely preserved. Since they were largely built with clay to bind the stone, most of the original materials have long since decayed. (At least this is my understanding.) However, the National Park Service has preserved the building using a custom, hand-blended substance. The structure is regularly inspected and maintained as necessary. This began in 1935, when the ruins were prepared for public display, and a Pueblo Revival-style museum and visitor center was constructed. Franklin D. Roosevelt designated Tuzigoot Ruins as a U.S. National Monument on July 25, 1939. The Tuzigoot National Monument Archeological District was listed on the National Register of Historic Places on October 15, 1966. Although the structure itself is really a sight to behold, there’s not much to it. The rooms are all very similar, and there are only a few signs offering further explanations. The walk to the top is incredibly short (~2 minutes), too. Where you’ll probably spend more time is the visitor’s center. There are numerous artifacts on display in the museum, and numerous displays. These exhibits depict the how the Sinaguan Indians likely lived, what they used for hunting and daily life, among other things, and also include interactive computer programs and video. We probably spent more time in the museum than outside looking around, but that’s not to diminish how cool the ruins are themselves–you can build a museum anywhere, the same cannot be said for ruins! As to whether Tuzigoot is worth the time, it depends upon your interests. Personally, I found Sedona, Arizona to be an overrated tourist trap, albeit one with great natural beauty. If you like the shopping, galleries, and other tourist-y things in Sedona, maybe Tuzigoot isn’t worth it for you. If you’re interested in the history and culture of the area and also find yourself underwhelmed with Sedona, Tuzigoot is probably for you. Regardless, you’re only out the half-hour it takes to get there and the $5 entry fee, so it’s not as if it’s a big loss if you find that Tuzigoot National Monument is a waste of time for you. 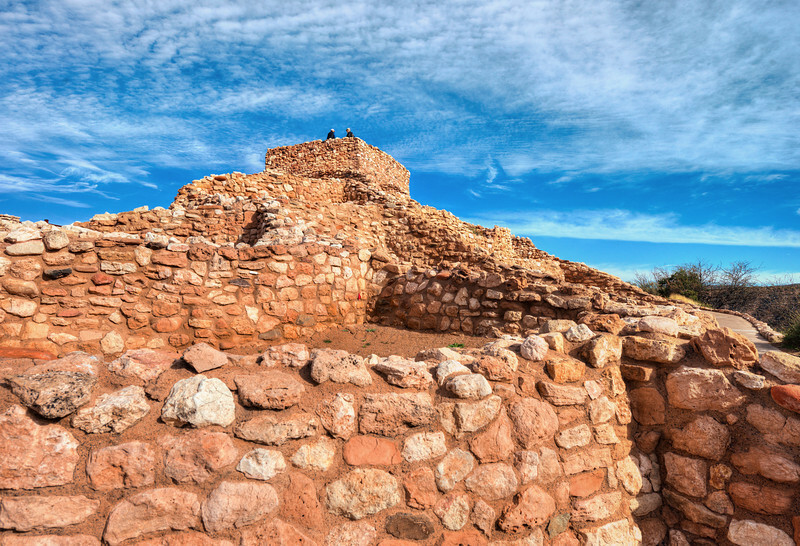 Have you been to Tuzigoot National Monument? What did you think of it? Does it interest you? Please share your questions and any questions you have in the comments! https://www.travelcaffeine.com/wp-content/uploads/2014/03/tuzigoot-national-monument-mountains.jpg 694 1024 Tom Bricker https://www.travelcaffeine.com/wp-content/uploads/2017/08/logo.jpg Tom Bricker2014-03-27 22:09:092018-05-03 04:01:48Review: Is Tuzigoot National Monument Worth It? Over the last year I had opportunity to explore various different national parks down in the US. Not a national park, but we did make a couple trips out to the Sedona area and saw many of the sites you mentioned. I’d agree, the town of Sedona was a little kitschy, and there were tourist traps galore (pink jeeps? ), but beyond that the outdoors culture and hiking & biking infrastructure was outstanding and some of the best I’ve seen. We stopped in at The Hike House, where a local guide recommended a few different less-busy trails. Once outside the town proper, I found it was some of the most photogenic landscape I had been in. One of those places where I nearly had to work to take bad pictures. I’ll be curious to see if you guys end up at some of the other National Parks I got to. Oh yeah, in terms of natural beauty, Sedona was unquestionably excellent. On the outskirts of town, there were also a lot of nice trails and other things to do. I had heard a lot about it as this great city, though, and I just didn’t see that. It was a tourist trap, albeit one with an absolutely GORGEOUS backdrop. The other thing that seemed odd to me…all of the top ‘hole in the wall’ restaurants that scored highly on Yelp specialized in hot dogs. I had a couple of good hot dogs, don’t get me wrong, but that still seemed a bit odd!